One of the most important design elements in any home is the floor. 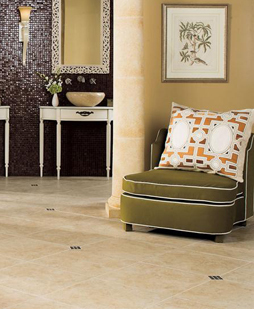 The right hardwood, tile, or vinyl flooring adds personality and style to your indoor spaces. For practical, attractive flooring in Lititz, PA, visit us at Cloister’s Flooring America. We have established our reputation as the premier flooring store with our affordable pricing and unbeatable selection. Whether you have purchased a new home or you are remodeling your current one, choosing the right flooring material for your lifestyle and design goal is crucial. Our friendly and knowledgeable store associates are here to help you find the best flooring for your project. Whatever your interior design preferences are, you are sure to find the flooring for you at our store. We’ll pair you with the resilient flooring that improves the way you experience your home. If you have pets or small children, we have options that are easy-to-clean and waterproof. If you want a soft feeling underfoot, our selection of carpets may be what you’re looking for. When you want something that continues to look great without heavy maintenance, we have you covered. Just let us know what you have in mind. Our associates will pick out the most appropriate materials for your home. Our service to our customers doesn’t end once the transaction is over. After you purchase your favorite flooring style, we offer installation by skilled professionals for your convenience. Our experienced installers do the job right the first time for maximized product performance, lifespan, and visual appeal. Updating your floors is an investment in your home that helps to safeguard its property value while improving its design appeal. When you decide that your flooring needs a makeover, come to our showroom. Our products, pricing, and services allow you to reimagine your space without any hassle. Contact us for upgraded flooring. Our showroom in Lititz, Pennsylvania, serves customers from throughout the area of Hershey, Elizabethtown, Reading, and Marietta.